It's a Day for Mother Earth. Cebu got numerous Events for Earth Day this year. Picking highlight for Aboitizlands' Persimmon Plus at Mabolo, Cebu. Events starts today till Saturday April 24, 2010. Their Earth Day Celebration will extend to Activities like Earth Day Bazaar and Earth Day Music Jam that would be happening tomorrow, Friday April 23, 2010. Performers for Earth Day Music Jam are Cattski Espina, Zara Smith, Scanting Skalawags, Fragile Muse, Grave Candle Tapati and with Special Performance from Chai Fonacier. More and more activities for Earth, from Earth Hour to these activity! Be part of it! 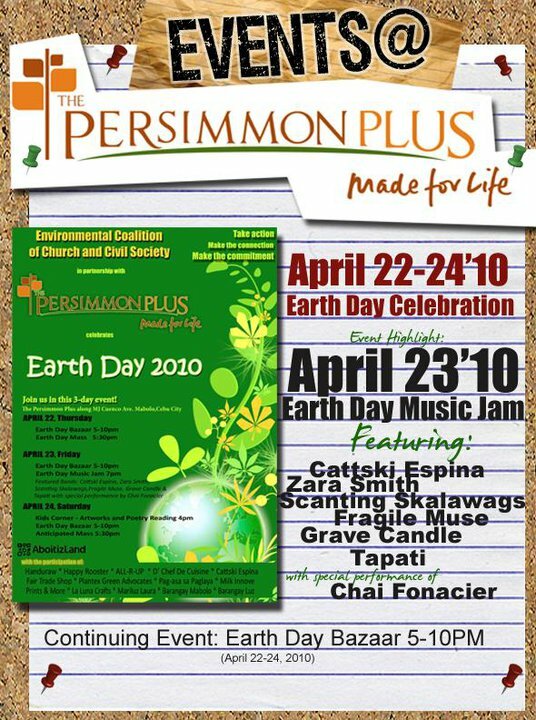 Earth Day Events in Cebu posted at Cebu Events Blog. 5 comments: on "Earth Day Events at Aboitizland's Persimmon Plus- Mabolo, Cebu City"
Earth day is an action day. Let's act to help save our only Earth by only doing the things we can. It basically it. Lets continue the momentum from Earth Hour. I hope Joey Ayala is singing..but he's not...where is he? Yeah, It would be great if he's Performing.